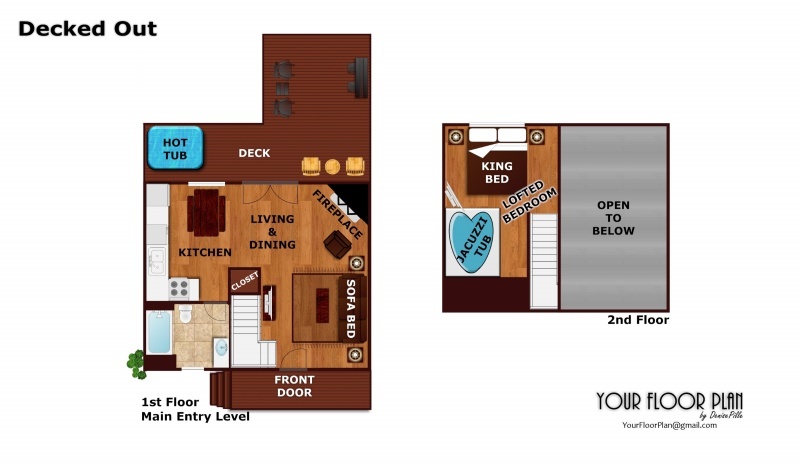 DECKED OUT is what you'll be, when you're kicking back in comfort at this Luxury 1 bedroom cabin! Conveniently located outside Pigeon Forge in the Spring Valley community, DECKED OUT is the perfect cabin for couples or small families. This well decorated, true log cabin, boasts vaulted ceilings, a stone / wood burning fireplace, fully equipped kitchen, and a large private deck for your enjoyment. Upstairs a King Log bed is the perfect place to enjoy a good night's sleep, or relax while watching the LCD TV. An in-room heart-shaped Jacuzzi tub for two adds a romantic touch. Pour a glass of wine and soak your cares away, or head out to the back porch with your favorite book. A covered back porch includes a private hot tub for 4, and shaded seating to enjoy the mountain air. Call today to reserve your stay and make sure your next vacation in the Smoky Mountains is DECKED OUT! We enjoyed our stay greatly. The cabin was very cozy and was very clean. It was very peaceful and quiet at the cabin and yet just a short drive we were back in pigeon forge. Our only complaint ( for us ) was the bed. Not a big deal. Didnt even bother to call in. Just not our mattress preference is all. We have been renting cabins through patriot for a few years now and always happy with whatever cabin we rent. This cabin was perfect for a couples weekend get away! We enjoyed having the Christmas tree up it was beautiful! This cabin is so so cute all the decor and the set up is precious! I must say we will be coming back to this cabin- the bed was absolute HEAVEN!!!! I have never been on vacation and love the bed as much as mine- but I did and cant wait to go back!!!! Sad we had to leave a day early due to snow storm, but those things happen! The cabin was amazing! Had a great weekend! Very nice, well maintained property. We loved the area and the easy check in and out. We absolutely loved the cabin!! We got married while we were there and my wife adored the cabin. It was everything we had hoped for and we will be returning in the future! Great cabin!! Loved all of the finishes. Hope to return soon.